Special Interview with Jack Cashill Author of "Scarlet Letters"
Jack Cashill is an independent writer and producer. He has written for Fortune, Wall Street Journal, Washington Post, Weekly Standard, and writes weekly for WND. Jack has written ten books of non-fiction under his own name, eight of which have been featured on Book-TV, and collaborated quietly on eight others. 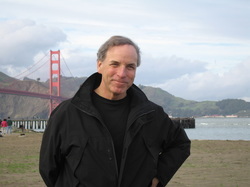 Jack has also produced a score of documentaries for regional PBS and national cable channels. Jack has a Ph.D. from Purdue. The New Scarlet Letters Doesn't Include An "A"
WASHINGTON -- In one passing scene from the HBO documentary Fall to Grace, former New Jersey governor Jim McGreevey, a self-dubbed "gay American," enters a church ostensibly more welcoming than the hidebound Catholic Church of his childhood. The message board on the church front reads, "Jesus, help us overcome the sins of racism, sexism, classism, and homophobia." Had the message board been bigger, the good pastor might have added climate change denial, Islamophobia, and xenophobia. In a postmodern world that prides itself on "non-judgmentalism," these have emerged as the seven new deadly sins, and God help the man, woman, or pizza maker who commits one. In Scarlet Letters: The Ever-Increasing Intolerance of the Cult of Liberalism Jack Cashill addresses the unholy rise of progressive neo-puritanism. As in old school puritanism, worshippers achieve a sense of moral worth simply by designating themselves among "the elect"–no good works required. To validate that uncertain status, they too heap abuse upon the sinner lest they be thought indifferent to the sin. Rather than simply cataloguing the neo-puritan assaults on reason and liberty, Scarlet Lettersillustrates how the progressive movement has come to mimic a religion in its structure but not at all in its spirit while profiling brave individuals like Clarence Thomas, Aayan Hirsi Ali, Camille Paglia and many lesser-known truth tellers who have dared to take a stand against this inquisition. Recently released by WND Books, Scarlet Letters shows in undeniable detail how an allegedly "liberal" movement has become so bizarrely punitive and inquisitional. 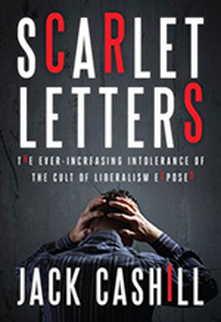 New York Post columnist Michael Walsh praises Scarlet Letters, saying, "There is a slithering evil that lurks at the heart of contemporary 'liberalism'–repressive, angry, intolerant and vengeful. Born of a century of cultural, political and structural Marxism, it seeks to crush dissent, enforce conformity and suppress any idea that does not conform to its atheistic, reductionist ethos. In Scarlet Letters, Jack Cashill strips the cant from such terms as 'denier' and 'Islamphobe' and calls out the leftists for what they are: villains, not heroes."